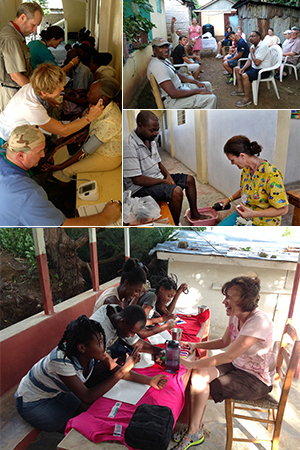 Are you interested in joining Family Health Ministries on a week long mission trip? Would like to provide medical care to Haitian patients in Port-au-Prince? Help to conduct a week-long Vacation Bible School? Join a service team in Fondwa to build and repair homes? Family Health Ministries offers a variety of trips to meet your individual goals for international mission travel. Please complete the steps below to begin your trip registration process. While individuals can sign up for any trip, we encourage small groups or groups of friends to go to Haiti together. The cost for a week-long mission trip is $1,000-$1,200 per person. Each person is responsible for the cost can reserving their own airfare. The entire cost of this trip is a tax-deductible contribution. Reference travel websites for flight details and cost from your city to Miami. Your Mission Travel Coordinator will inform you whether your team will depart from Miami or Fort Lauderdale to Haiti. Questions? Contact our Mission Travel Coordinator with any questions not answered below. 1) Download a copy of the FHM Mission Guidebook to find out more about a FHM mission trip, Haitian culture and important tips for packing and travel in Haiti. 2) Select a trip from the list below. Once you apply, the Mission Travel Coordinator will be in touch with you about all the details and preparations. 4) Apply for a passport if you don’t already have one or renew your passport if it is expired or expires soon. Be sure to send a copy of your passport to us by email or mail. 5) Vaccinations: refer to the FHM Mission Guidebook for a list of suggested vaccinations for travel in Haiti. 6) Read the latest CDC information on traveling to Haiti and take care of any medical needs, e.g. anti-malarial chloroquine pills, etc. 7) Book your airfare. The FHM Mission Travel Coordinator will assist you with selecting your flight. 8) Pay the balance on your trip within 30 days of departure.